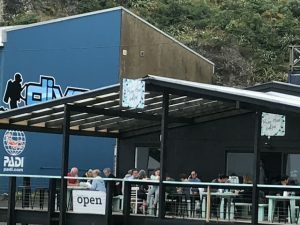 Situated on Wellington’s South Coast, this light and airy cafe is a good place to go if you’ve been exploring the rock pools in the Marine Reserve or perhaps walked some or all of the way to Red Rocks. There are no toys or colouring in for kids (so you might want to BYO if your kids need a distraction) but the view is pretty stunning with ferries, fishing boats and even sometimes dolphins all passing by. There’s the option of sitting outside on the large covered deck or there are lots of tables inside as well. The menu is for ‘brunch’ as it covers breakfast and lunch with the addition of sweet treats on the counter if you’re just after some morning tea! Gluten and dairy free options are plentiful and there’s a good selection for vegetarians and vegans too. The kids’ menu has things like pancakes and ice-cream, bacon and eggs, fish and chips (the fish is fresh and comes pan fried rather than battered). There are highchairs and a change table. Address: 410 The Esplanade, Island Bay Wellington. It’s between Island Bay and Owhiro Bay. It’s next-door to the diving shop. There’s a car park opposite on the sea-side of the road. Open: Tuesday, Wednesday & Thursday 8am – 4pm. Friday & Saturday 8am – 7pm. Sunday 8am – 5pm (Closed Mondays).